The August 2005 release of Cube is out! This potentially last release mainly fixes bugs, but also adds plenty of new maps. Sauerbraten, the "next-gen" version of Cube is in development! Cube ported to Intel XScale + OpenGL ES architecture, demoed by Intel at GDC. details. Allows in-engine editing of geometry in full 3D (you fly around the map, point / drag stuff to select it / modify it), which can even be done simultaneously with others in multiplayer (a first!). Has simplistic but effective fine grain vertex lighting that looks like lightmapping and can do dynamic lights & shadows. Doesn't need any kind of map precompilation, even lighting is done on the fly. 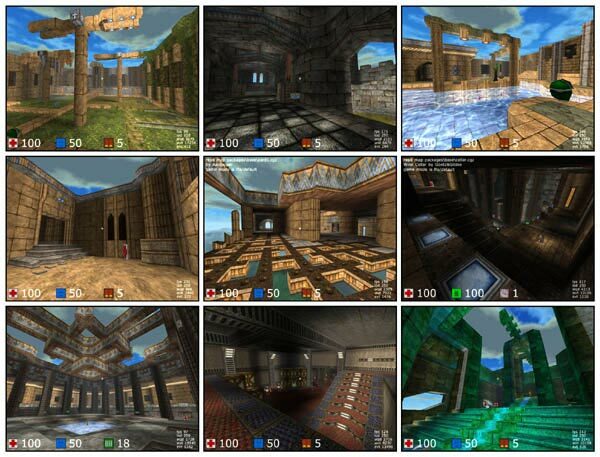 Has very simplistic quad-tree world structure that can do slopes (heightfields with caps) and slants, water, does decent collision detection & physics, has client/server networking that goes a long way in giving a lag-free game experience, and features a Doom/Quake-style singleplayer (2 game modes, savegames) and multiplayer (12 game modes, master server / server browser, demo recording) game with some uncompromising brutal oldskool gameplay. You can always download the latest release in the file section. Officially supported platforms (client & server) are win32, linux & bsd (x86), macosx (ppc) and pocketpc (xscale), and includes source code (open source: ZLIB license). A recent readme is here that gives some more information. Some screenshots. The cube/Sauerbraten IRC channel is #sauerbraten on irc.quakenet.org. The Cube & Sauerbraten wiki. Very old graphics engine stuff, some of which was the basis for cube. The author: Wouter van Oortmerssen. Cube maps & mods listing site Quadropolis, Probably the best ever mod for Cube: ActionCube, german community site getcubed, oreilly's cube article, Underworld's cube sp review site, flipcode IOTD, cube page at Happy Penguin, a GBA engine inspired on cube engine algorithms: Yeti3D, dcp's cube soundtrack (! ), models, textures etc, cube review in czech and another, cube tube, ESL cube 1v1 ladder, ESL cube leagues, ESL cube 1on1 summer cup, and the now finished winter cup (good demos! ), The pingpong cube soundtrack, lokirulez german cube information page. A course at Brown U. that uses Cube. cube mappers sites: pushplay, GomJabbar, SirLiveAlot, spentron, nilfilter, Ninja, Bal, bobbity, kedric, coryfeldman, nieb, mitaman and others, miked, jcdpc, staffy, drian, enigma, six dog studios. cube mods/pcs/tcs: cube for MacOSX, Death Illustrated, Fisheye Cube mod, Quad mod. cube clans: nrwt, team zero. Want to learn how to write your own games/engines? Join the Guildhall at SMU, where I and other game developers teach.